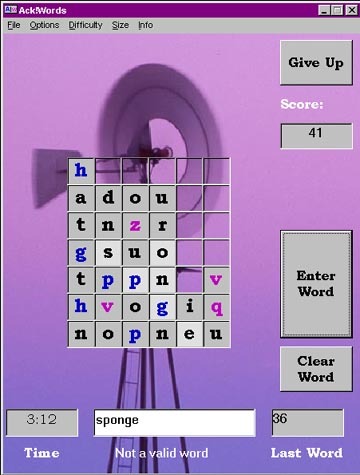 Ack!words is an new word/puzzle game that requires creativity, strategy, and good spelling. 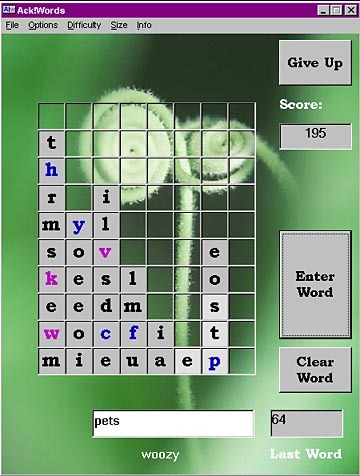 To play, you connect adjacent letters (in any direction) to each other to form words. When you find a word, the letters are removed from the board and the letters above fall down. 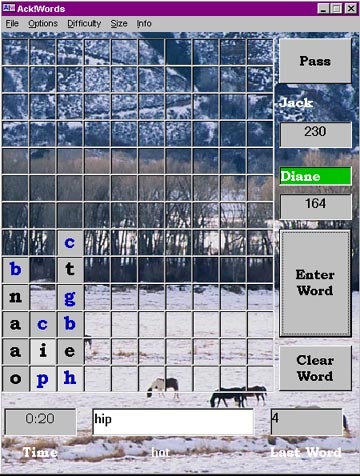 The object is to make large words, using hard letters while unltimately clearing the board. It's actually harder than it sounds. To clear the board, it takes strategy to have the right mix of letters at the end to use them all up. Making high valued words requires planning to move the letters into position. Of course, creativity is always needed to see words in the jumble of letters. Version 2.1 has been released! 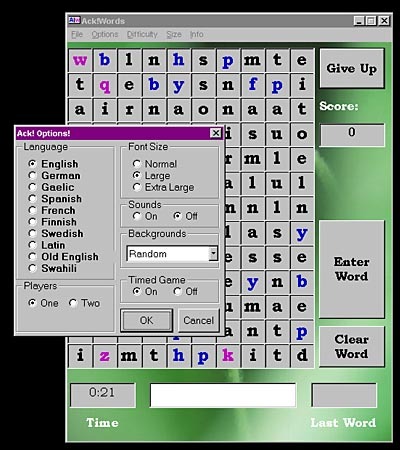 (10-11-02) It includes a new mode of play and lots of new features. Download it today! 10 languages: english, finnish, french, gaelic, german, latin, old english, spanish, swahili, and swedish. All features are enabled in the trial version for 21 days. If you enjoy the game and play it after the trial period, please register. When you do so, you will have a fully functional version and receive free upgrades as they're released. You can register online and get a peronalized registration key instantly. Ack!words is copyrighted 2002 to Don Johnson and Ack!soft. It is shareware and may be redistributed without permission for 21 day trials. If used beyond that period, it must be registered. Please email me at to report any bugs or make suggestions for future version.